No one wants to find bed bugs in their home, especially in their bedroom. While they’re called “bed” bugs, these harmful home invaders can find a comfortable spot in your couches, chairs, and even on your bookshelf. 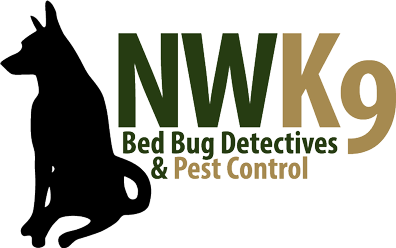 As your bed bug exterminator in Seattle and the Puget Sound area, Northwest K9 Bed Bug Detectives knows that an infestation can be a very unsettling thing. Our extermination methods will rid your home of bed bugs, as we turn up the heat on the little pests. While pesticide treatments can be effective, they don’t do anything to the unhatched bed bug eggs. Another application will be required once the eggs hatch and you find new bed bugs crawling through your home. Our team utilizes heat treatment to eliminate the bugs and this method proves much more effective than pesticides, since the entire structure is heated and the exact location of the bugs doesn’t need to be specified. Any bed bug in the vicinity will be affected, whether it’s an adult, nymph, or egg. We’ve found that this process is very effective at eliminating any and all bed bugs in your home or business. Heat treatments also allow homeowners to keep furniture and belongings, instead of having to throw them out following an infestation. We of course understand that you may want new things following an infestation, but as your bed bug exterminator in Seattle, we will make sure that there are no more pests hiding in your home. Call us today at 206-801-3522.